Sharon started her conference on Monday afternoon, while I traveled back to Sacramento at the end of the day. After a quick breakfast at Starbucks, we headed out. The first stop was the Charleston Museum. 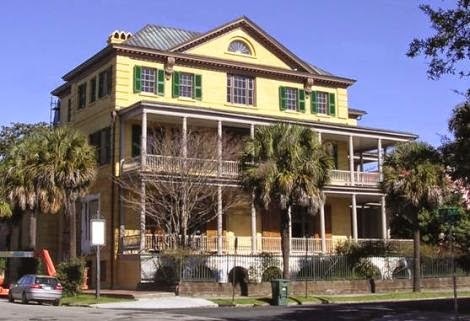 The Charleston Museum is billed as the oldest museum in the United States. It was founded in 1773 and opened to the public in 1824. We did a quick walkthrough. The tour guide talked on Saturday about how South Carolina was a major rice growing state. Both Sharon and I were surprised by this fact. Apparently, for almost the first 190 years of rice production in the US, the principal producers were South Carolina and Georgia. The museum had several exhibits highlighted rice growing in the state's early history. From the museum, Sharon and I walked around the corner to the Aiken-Rhett House Museum. We did a 45 minute audio tour. This house was a little different. Rather than working to restore the house to its original condition, the house shows the changes and wear of its 200 year history. Sharon didn't like the tour. She felt like it was not safe and that the slave quarters and the house were going to collapse underneath her! Taking a route that we hadn't walk before, we headed to Blossoms for lunch. Sharon had a Jumbo Lump Crab Tostada Salad, while I had Lump Crab & Fried Green Tomato BLT. Back at the hotel, Sharon went to the opening of her conference, while I packed. About 2:00 pm, I caught a taxi to the airport. I took a 4:40 pm flight from Charleston to Chicago and then a 7:00 pm flight from Chicago to Sacramento. We landed in Sacramento about 9:45 pm. By the time I collected my luggage and drove home, it was 10:45 pm.